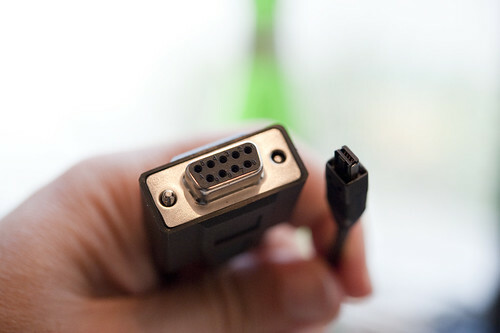 A ridiculously quaint DB9 connector attached on the far end to some peculiar, but not-mini-USB connector. (Best as I can tell, the thing on the other end is a proprietary connector, but I’m prepared to be proved wrong. Every of the variety of old and new *scaled* USB connectors I have lying around would not fit into the connector port on the device that is meant to be connected). The grotesque scale difference reminds me of the queasy feeling I get when I stand close to and look up at tall things like grain silos, especially. Well, although I am intellectually peeved that I am still finding things in the 21st century that contain DB9 connectors on them, what I am intellectually curious about is how, when, why and what becomes *legacy*? How do things such as this enter into the idiom of *quaint*, or *old fashioned*? How long before such things become *obsolete*? What standards, norms, expectations, specifications, technical requirements compel a *holding onto of the past? * What are the scales of historical pasts — retro, old-fashioned, quaint, legacy, plain-old, ancient — and how do they shape design and engineering possibilities for the near future? Why do I blog this? Attempting to understand how to make the future into today, possibly by making extraordinary things that might come to be into either ordinary or even normal and everyday and then into quaint and old-fashioned. I am curious as to how to play with scales of time to help place things/experiences/moments that might be quite near futuristic into the quotidian, everyday. That is, making the new crazy stuff ordinary so we can begin to explore the kinds of rituals and practices that these things exercise. At the same time, reflecting on how Everything That’s Happened, Has Happened Already — so how do you create those moments that elevate the experiences that are now happening again rather than over-fetishizing the technical and instrumental aspects of the kit?